Who’s ready for Thanksgiving? Know what you’re making? Need a last-minute dessert? These Maple Pumpkin Pots de Creme could be the impressive after-dinner sweet your gathering needs. I was chatting with a friend the other day and told her all I have to do for the big day is provide a salad for my husband’s family’s get-together. “How did you get off so easy?” she asked. I hadn’t thought much about it, but she’s right: since I don’t host Thanksgiving, I don’t have to worry about cleaning my house, don’t have to provide a slew of side dishes, and I certainly don’t have to get up in the wee hours to put a turkey in the oven. Still, since I so enjoy cooking–and the many delicious flavors of the holiday season–I’m actually happy to make additional dishes for Thanksgiving. Though pots de creme (a velvety, creamy pudding, if you’re not familiar with the term) is traditionally made with chocolate (recipe here if you happen to need one! ), this unique boasts the flavors of pumpkin and maple syrup. It’s not unlike a crustless pumpkin pie, just creamier and richer. And it’s surprisingly simple to make, with just seven easy ingredients. So even though I don’t technically have to make a dessert for the big feast, I don’t mind if I do! 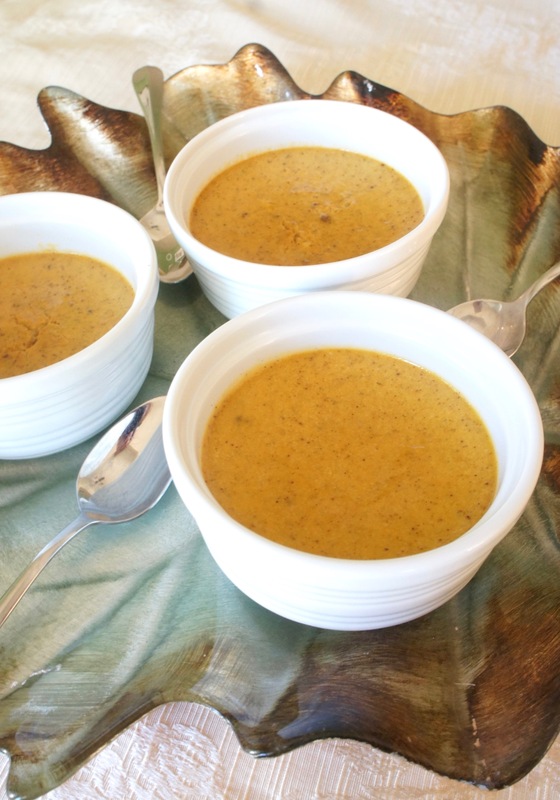 A simple, creamy pumpkin custard sweetened with maple syrup! Preheat oven to 325 degrees. In a heavy saucepan, whisk together half and half, maple syrup, and pumpkin. Bring to a simmer over medium heat. In a large bowl, combine egg yolks, cinnamon, nutmeg, and salt. Slowly add hot pumpkin mixture to egg yolk mixture, whisking constantly. For easy pouring, transfer to a large measuring cup with a pouring spout. Set out six ramekins and divide pumpkin mixture between them. Place ramekins in a 13 x 9-inch baking dish, then carefully pour hot water into the space between ramekins until it reaches halfway up their sides. Cover dish tightly with aluminum foil and bake 40-50 minutes, or until a knife inserted in the center comes out clean. Chill at least two hours before serving. Dollop with whipped cream, if desired.